This post is a brief apology for bad maths. Earlier this week I noticed Manchester United had made a "13G filing". This is an American regulatory declaration required when an investor has taken a significant stake in a quoted company. The filing said that Baron Capital Group Inc and various related companies and funds now own 9,581,636 "A" shares in Manchester United, 24.07% of the total number of "A" shares in issue. 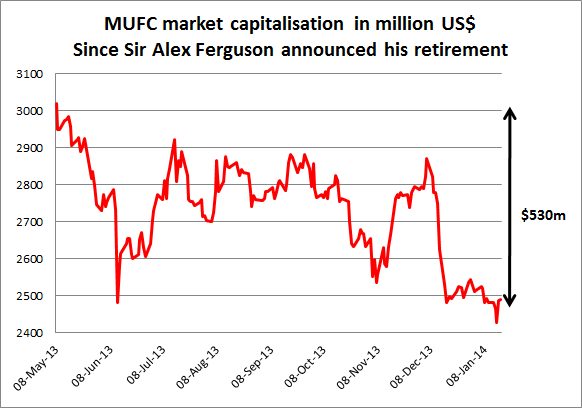 For those asking, Glazers own 90% of @ManUtd, 10% available on stock market. News today is one investment firm has 24% of that 10%. Well I should have looked up the figures, because that isn't right. There are actually 39,807,000 "A" shares in issue of which 16,666,667 were floated on the NYSE and the balance are owned by the Glazers. The "A" shares are themselves c. 24% of the total number of "A" and "B" shares in the company. So Baron Capital owns 24% of "A" shares and therefore owns more than 5.5% of the club. What's more noteworthy perhaps is that the firm has hoovered up over 57% of the shares available on the NYSE, which goes a long way to explaining the strength of the share price in recent weeks. Before anyone gets too excited, Baron Capital aren't looking to takeover United, they just think the shares are cheap. Are they right? I don't think so, but stock markets are always about matters of opinion. Anyway, apologies from me for not looking things up properly. Apologies too to Bloomberg and the Associated Press who both quoted my incorrect calculation. We should all be extra embarrassed for reporting that a 13G filing showed an investor had 2.4% of a company. Why? Because 13G filings are only used when an investor has bought more than 5% of a company. Ooops.